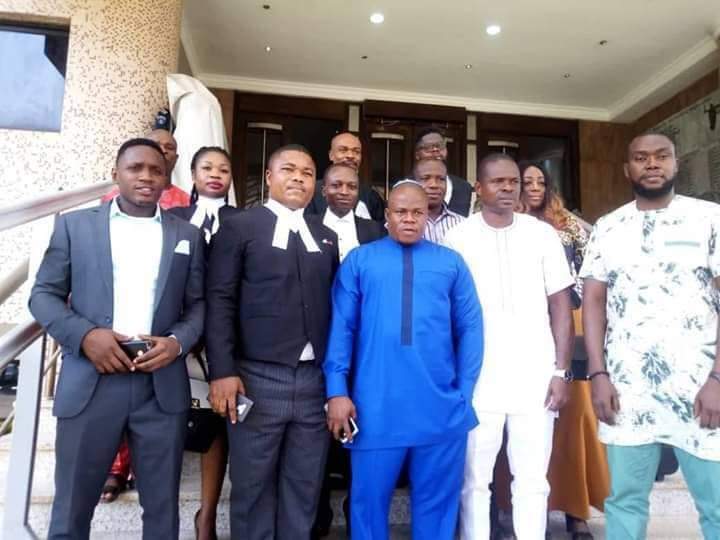 ABUJA— Hearing on the case involving four members of the Indigenous People of Biafra, IPOB, who are being prosecuted by the Federal Government over charges bordering on conspiracy to commit treasonable felony, improper importation of goods and illegal possession of firearms, continued on Wednesday before Justice Binta Nyako of the Federal High Court sitting in Maitama, Abuja. Recall that at the previous hearing on Tuesday, the Federal government presented copies of some documents in court, which contained statements allegedly made by the second defendant, Mr Chidiebere Onwudiwe and a witness to collaborate the contents of the document. However, when Onwudiwe, appeared in court today, he gave testimony on what transpired during the period of his detention at the facility of the Department of State Security Services, DSS, and the authenticity of the statements presented in court by the prosecution counsel. While being led in evidence by counsel to the defendant, Ifeanyi Ejiofor, Onwudiwe, narrated his travails in the hands of the DSS and how they compelled him to make written statements at the DSS facilities both in Port Harcourt, Rivers State and in their headquarters in Abuja, contrary to the statements of the FG’s witness who testified as Mr CD yesterday. According to Mr Onwudiwe, “I was arrested on Wednesday, June 22, 2016 in my house; and detained in DSS custody for about three weeks. “Two males and a female from the investigation department of the DSS interrogated me. I made some of the statements, the rest were products of the degrading treatments meted on me by the DSS. “On July 5 or 6, 2016; but supposedly on a Sallah day, I was blind-folded, in chains (hands and legs), and was driven from Port Harcourt to Abuja. When we got to Abuja, I was sent for a medical check-up because my private part was bleeding after the DSS had injected me. From there, I was taken to the operational department. “After some days, I was taken to a facility called ‘New Eko,’ then they called me later for investigation. It was in the investigation department that I met Mr. CD. “Thereafter, he assigned me to Mr. CD who asked me to do what their boss required of me, because they had ‘killed’ Benjamin Madubugwu and David Nwawuisi for refusing to write what they requested of them. “Mr CD dragged me back to their boss’s office still in chains. He handed me over to the ‘handlers’ that took me to another cell. The handlers were not part of the investigation team but torturing team. I was sent to a smaller room (6 by 6 feet), duly aired by a 2.5HP air conditioner. I spent about a month without food, but was only drinking water from the tap. “After a while, I was taken back to their boss in an underground cell. He asked me if I want to die, or write a statement that would set me free. Then he directed Mr. CD to return me to their own department. “Therein they brought out a written note and asked me to copy its contents into my statements. After copying the statements, I refused to sign. One of the members in the investigation department brought out a short gun; he told me that a lot of damages could be met (on me) with the gun, that nobody knew where I was. He told me it is either I sign or I die. "After I signed, I was sent to another cell known as ‘Old Eko’ (room 1). I spent about three weeks therein, after which I was invited for another statement. During the second statement, they told me that most of our members have been arrested, and they have told them everything they needed to hear; the only thing remaining and what they require of me, is to pen down same the way they (DSS) want it. “In the process, a group I would call ‘external investigators’ came into the cell; which made them take me to another cell, tagged ’New Eko room 9’. In that cell was one James Malu, and a Tuberculosis patient, frequently vomiting blood, named Abacha. I was left in there for another two weeks before I was brought out. “That was when they showed me a couple of statements written on a DSS sheet; and that I would be going to court on November 7, 2016. I was pointed towards two statements on the sheet, which I was compelled to sign otherwise I won’t go to court. During cross-examination, the prosecution, Shuaibu Labaran asked Onwudiwe whether he was under any form of compulsion when he was giving his statement to DSS in Port Harcourt and he answered in affirmative. He insisted that the statement he gave in Port Harcourt was exactly what the DSS told him to write. But Labaran objected, telling the defendant that his statement means he wasn’t even aware of what was contained in the statement but he answered that the DSS brought their own to join to his. He said, “they(DSS) told me what to write in Port Harcourt and the only thing he knows that was written in the document was the Indigenous People of Biafra. He also answered that he was tortured before giving statements in Port Harcourt, adding that the very first statement he made to the DSS was not brought to the court apart from those he made under compulsion. However, the presiding judge stated that she was unaware of the defendant’s detention in Port Harcourt and thereafter adjourned till May 28, 2019, granting the parties time for the filing and adoption of written addresses.